Tom Atkins was strong in the contest with a game-high 12 hard ball gets. The Bendigo Bank Cats were no match for a classy Casey outfit in their Qualifying Final clash at Casey Fields on Saturday. The home team got off to a terrific start, kicking the opening five goals within 15 minutes and went onto dominate the remainder of the match, running out 91-point winners. After kicking into a strong wind in the first quarter, the Cats started the second quarter positively but were wasteful in front of goal. Those missed chances allowed Casey to re-adjust and swing the momentum back their way to take a comfortable 35-point lead into the main break. There was no stopping Casey in the second half, with the Dees midfield on top and Cam Pederson (four goals) and Mitch Hannan (three goals) proving deadly in attack. Cats Coach Shane O’Bree was clearly disappointed with the team’s performance. “They were bigger and stronger around the contest than us and consistently did it well,” O’Bree said. Despite the lop-sided scoreline O’Bree did acknowledge the efforts of captain Tom Atkins and young gun Lachie Fogarty who were the Cats best by a ‘country mile’. The Cats now get a second chance after finishing the home and away season inside the top four, and O’Bree is hopeful that this performance is a ‘one-off’ as contested football has been a strength of the side this season. First-year Cat Charlie Constable played reduced minutes with hamstring tightness. 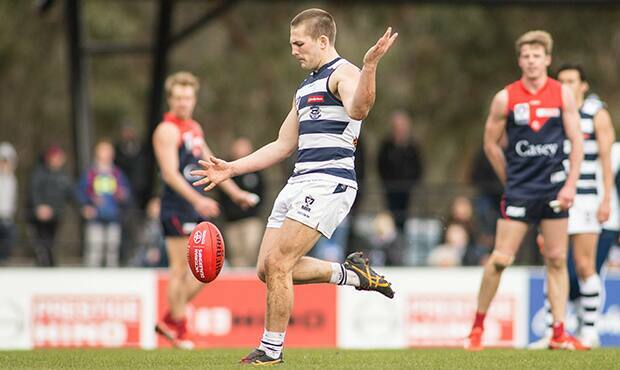 The Cats will play Box Hill for a place in the Preliminary Finals.